Hello everyone, it's Friday again and with tomorrow being the first day of December, we're hoping you're all well on the way with those Christmas preparations! It's time for a new challenge and this week we have a good mix of Christmas and non festive creations to inspire you - good if you're ahead or really fed up with Christmas stuff! The first placed winner from this challenge will receive copies of the absolutely gorgeous Studio 12 Picknix Collection 1 CD and also the Picknix Collection 2 CD - Gingerbread Twist! The second and third placed winners won't be left out either as they will both receive a lovely download. Please don't forget to follow our rules which are below as we wouldn't want you to miss out! Congratulations! Rysa please email Nikky to claim your prize and all the blinkies can be found in the sidebar. Please remember to add the verification code and the challenge week in the subject field on your email - you must use the code given above to claim your prize otherwise we cannot release it. Good luck with the challenge - the deadline for entries is Sunday 9 December at 12noon GMT. Norine: I needed to make a "Sorry-for-what-you're-going-through" card this week, and this sentiment from the Sugar Plum Daisy cd and papers from the Paper Boutique Projects cd seemed perfect! I printed the sentiment three times on different patterned papers, cut them out and then pop-dotted them for some extra dimension. The die cut embellishment is from Marianne's. Fliss: I'm still making Christmas cards and this is one of the specials for my relatives using elements from the Here Comes Christmas CD with a vintage twist. I also flipped the sketch so Mr Snowman would be facing the right way! I coloured the gorgeous snowman (he's my fave of Nikky's so far) with Aquamarkers and was very pleased with his scarf which I made look woolly with squiggly lines and dots using the fine end. I distressed the edges of the papers with an emery board and added Vintage Photo Distress ink. I then made a hand cut icicle border using white embossing powder, glitter glue, a lilac Promarker and a snow writer. Karon: It was my daughter's 14th Birthday on the 29th Nov - so I decided to make a card using the sketch provided. For the main polka dot layer, the frame and tailor's dummy image, I used All Sewn Up from Picknix Collection 1 CD, I merged the three elements together in Word. 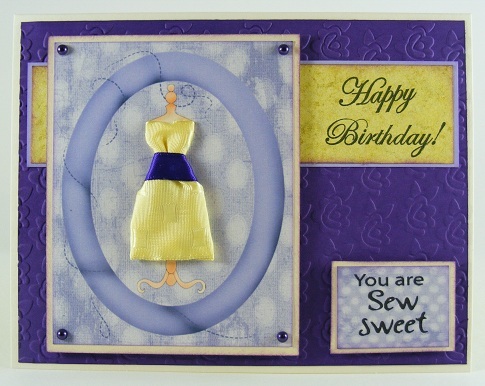 Also the same for the "You are sew sweet" sentiment and the layer for that too. I inked all my edges of all my layers. The dress is a little bit of wide ribbon in yellow and then a little bit more ribbon for the tie in the middle. I popped up the two front layers with foam squares. Asha: I'm not done with my Christmas cards. This week I've picked papers and a cute image from the PickNix Gingerbread Twist CD. I coloured the gingerbread dolly with alcohol markers and fussy cut her before popping her up on some foam tape. 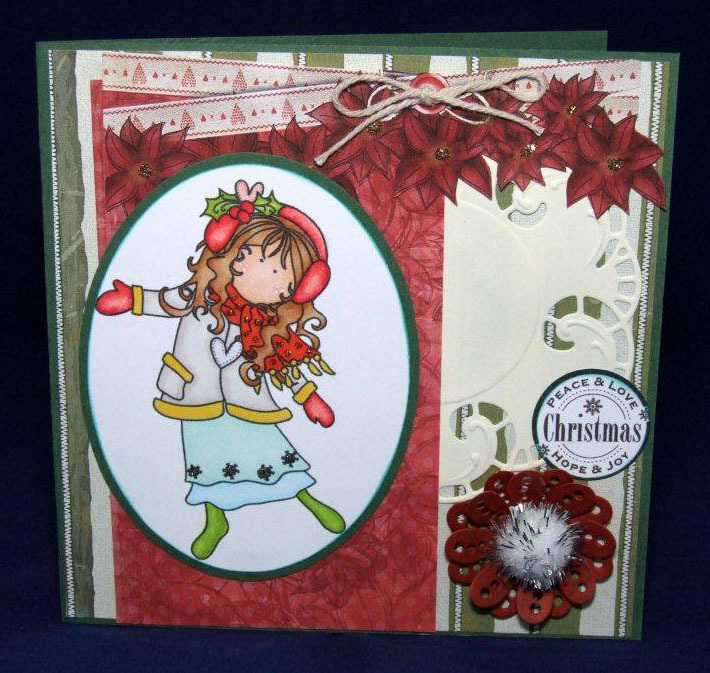 That gorgeous poinsettia bloom is the work of Marianne Creatables Poinsettia die (LR122). To finish: thin gingham ribbon, brad and red glitter from my stash. A stress free and easy peasy card to make! Sally - Hi there, this weeks challenge is The Sketch Challenge. 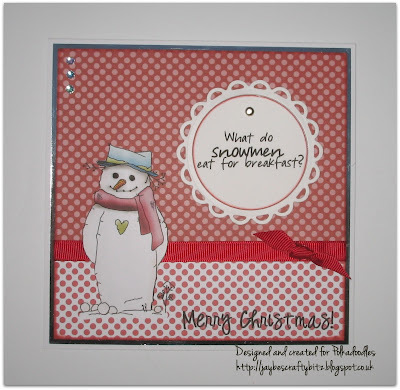 So I chose a snowman image from Picknix 2 CD Rom and a backing paper. I matted and layerd the papers with red cardstock for the background and for the rectangle. Cut an oval and embossed it with my dotty folder and distressed the edges. 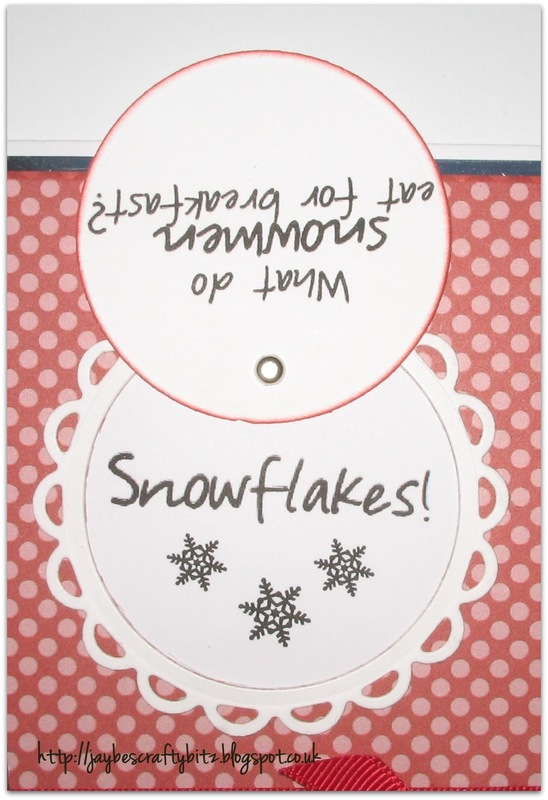 Stamped and cut out a sentiment, tied some snowflake ribbon around the base card, added a bow and snowflake and a little red button. Astrid - I have used an image from the CD Collection Sundae of Seasons and coloured it with copic markers. Some stickles gold on her dress and her scarf. The paper is from the CD Picknix 2. I have cut the flowers on the paper off and added them at the top with a piece of knotted string. I used a die from Marianne Design for the flower and behind the image. And on the flower I added a pompom. Miria I used non traditional colours for my Christmas card; the stampie, papers and tickets are from Here Comes Christmas CD. I die cut the nestie for the image and created faux stitching with a white gel pen; I added a ribbon and just two half-pearls. 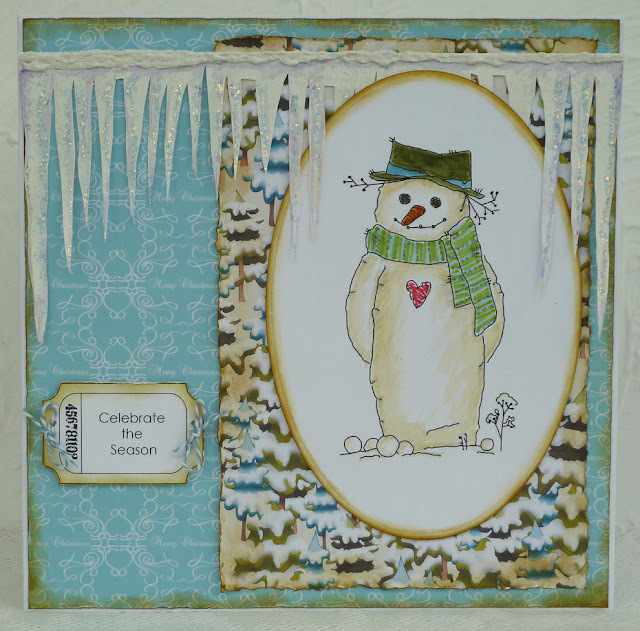 Valou250809: For my card I used the " Winter " collection from the " Sundae of Seasons "CD. All the papers are stitched with my sewing machine. Under the image, I added a die-cut doily. For the decoration, I added bows made using the satin ribbon, some stick pin pearls, a big red rose, gems and lace. For some sparkle, I added some touches of Stickles glitter glue. Alethea: I had lots of fun making my card this week!! I used papers from the Welcome Home and Heavenly Garden collections from the Picknix first CD and some from CD Picnix 2. The house and the fence and sentiment are also from Welcome Home. I used the already coloured images as I'm loving experimenting with all the digital images!! I added glitter glue around the houses, added some flowers along the fence, a few rhinestones and made some shrinky dink butterflies. I wanted the fence to open so cut some slits in and threaded the ribbon through. I just love the way it turned out. Fabi - I've used images and papers from the Sundae Of Seasons CD, all layered up with a pretty doily, some distressed and then decorated with some lovely flowers and foliage dusted with a little faux snow. Patty - Here's my card for this week - I have used the sketch and sometimes I get a block when using a sketch but this was not the case with this one. I used girl image from Pretty Sweet CD and the green paper is fom PPC5. I like very much the green & blue combination even for girls as it is so soft and sweet at the same time. I liked this girl from the first time I set eyes on the CD images, she looked so different laying on her back is like she is making exercise but not really. A hello card was perfect for this. 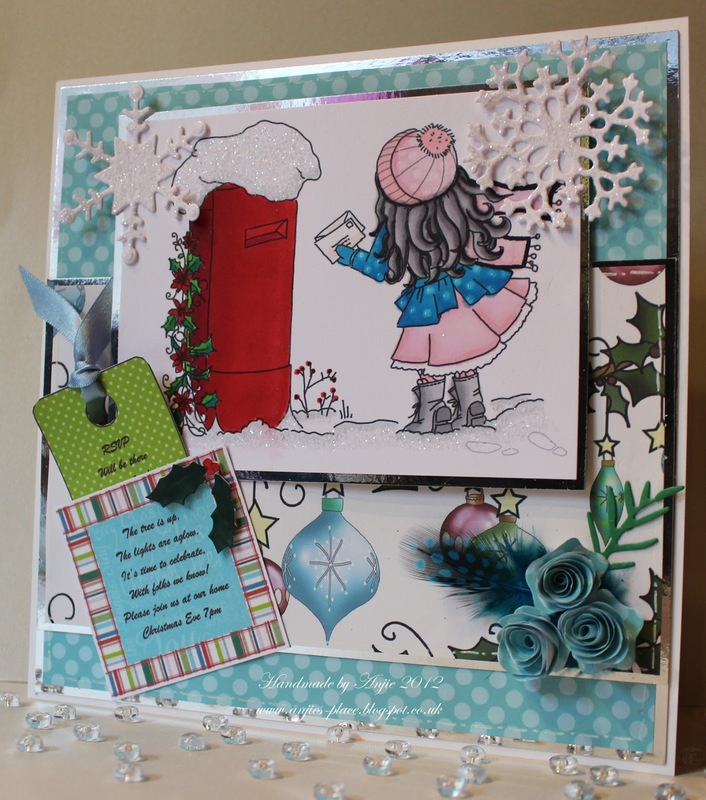 Lidia - I've made a Christmas card with the lovely sketch and all the elements and papers on my card are from the Here Comes Christmas CD. I used one of the lovely toppers and embellished my creation with some pretty snowflakes adding some star shaped gems and finished off with a button tied with string. So there you have it - a gorgeous array of samples to inspire you so hoping to see you enter. You have until 12 noon on Sunday 9 December to link up your creations and good luck! Welcome to another Polkadoodle challenge! Christmas is creeping ever closer and I think the team are getting prepared judging by the samples for this weeks challenge! Before we have a look at the samples, I need to announce the winner from challenge 45 which was to make a Christmas Party Invitation. Entries were rather scarce so we can only assume that you are all going to parties over Christmas rather than hosting them! Less cleaning up I say!! Anyway, the lucky winner of the Studio 12 Picknix Vol 1 CD is Dawn! Congratulations!! Please email Nikky with your postal details - all the blinkies can be found in the sidebar. Please remember to add the verification code and the challenge week in the subject field on your email - you must use the code (PD1W474) to claim your prize otherwise we cannot release it. So that gives you lot of opportunity to crack open those Christmas dies that you've not yet used! The first placed winner will receive a copy of the Colour Therapy DVD! Good luck with the challenge - deadline for entries is Sunday 2 December at 12noon GMT. Before you go, just have a look at the stunning Design Team samples!! Ruth: I've used papers from Here Comes Christmas cd (you can just about see them!) plus I've cut out some Poinsettia's from the cd too. 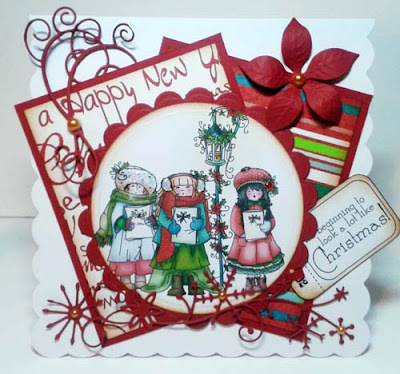 I've used my fresh out of the packet Marianne Creatables Poinsetta die and using some red card from my stash. I've cheated slightly and made leaves with green card! I've handwritten the sentiments which are on Sizzix scallop tag dies and then added some ribbon from my stash. And the best bit - the card actually stands up! Result! Karen - I used the Picknix 2 CD for the image, sentiment and BP for this card. This image is ready coloured, so I just added sparkle. All the dies used on this card are Mariannes. Shell-For my card this week I have used the stamps and papers from the PPC5, the image has been coloured using a mix of copics and promarkers. I used some nesties to make the frame for her to sit on, the flowers are Marianne (LR0163) I then added a few pearls and a little lace to finish. 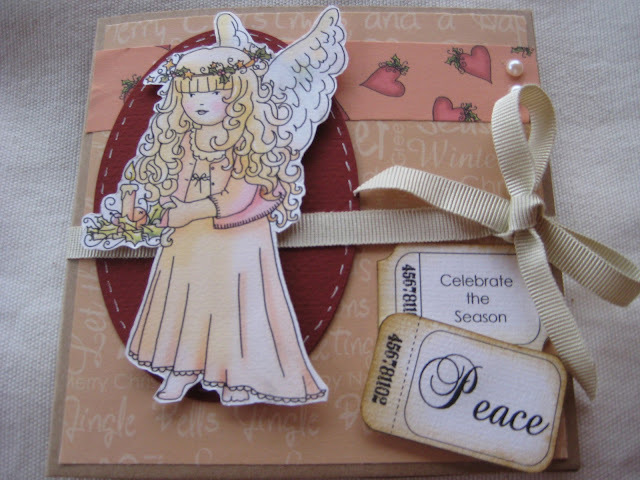 Helen - For my card this week I have used images from the Sundae Of Seasons CD ROM. I printed off 3 backing papers, a holly border and a text plate( which I added the text to). 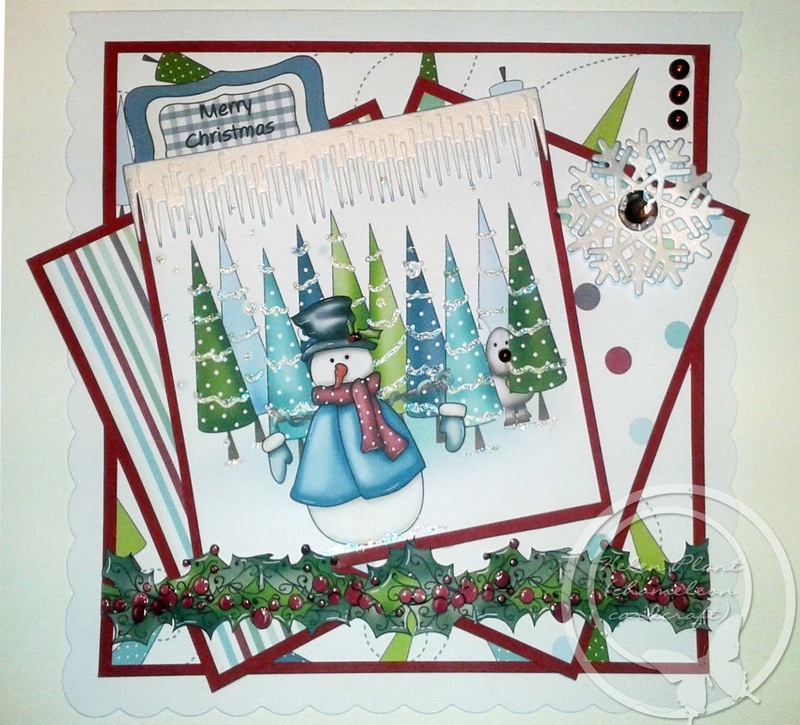 For the main image I combined the tree background with the snowman and put a little reindeer hiding in the trees. The dies I used are Marianne Icicle border and snowflake. I added glitter and pearls to finish off the project. Anjie - For my card I have used an image, papers and embellishments from the Sundae Of Seasons CD. The image is coloured with ProMarkers. The doily is the Marianne D Designer Doily, the butterfly is the Marianne die CR1205 and the flowers are from the Marianne die LR0107. I've added Doodle Dewdrops to the centre of the flowers and some bling on the butterfly. NJ I have used Sundae of Seasons for my card this time. 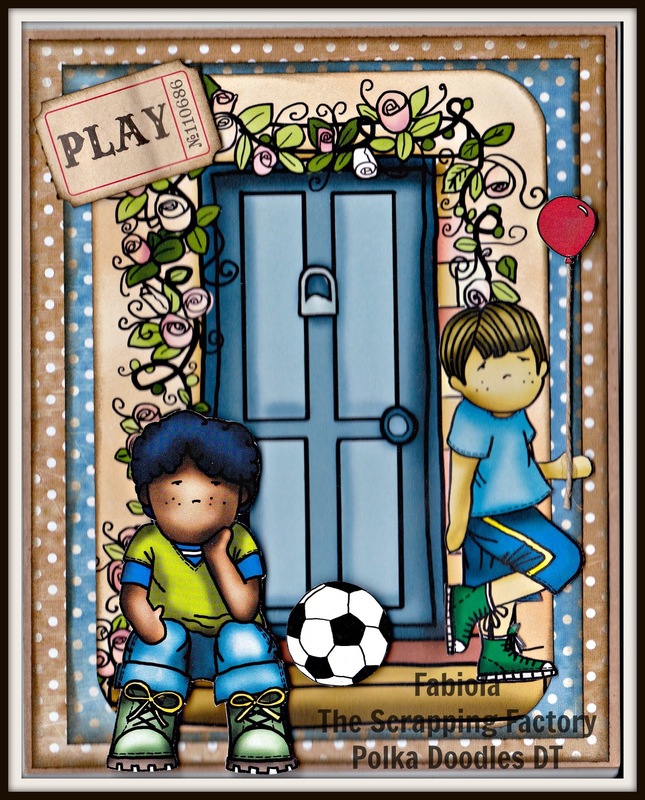 I inked all the edges with distress ink, and die cut using Marianne design dies LR0131 and LR0118. I love buttons too so couldn't resist finishing off with them! Anne - I've used papers from the Pen & Paper kit 3, this gorgeous girlie is from the Candy Doodles cd and the sentiment is from Sugar Plum Daisy. JAN: I decided to wrap a present and make a gift tag this week, using papers from the 'Paper Boutique Vol II CD' and a little sentiment from the 'Here Comes Christmas CD'. 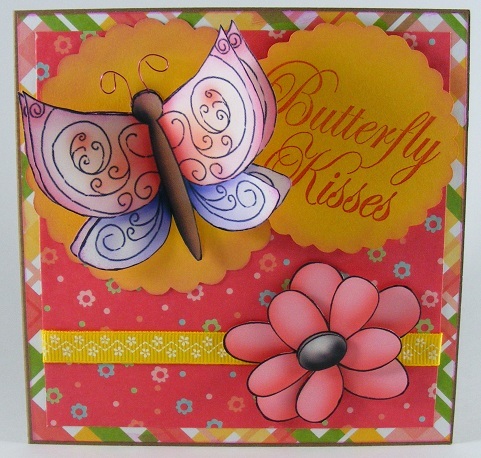 I used the little swirl die from the Marianne LRO108 Flowers set and cut it eight times adding it to the shaped tag. 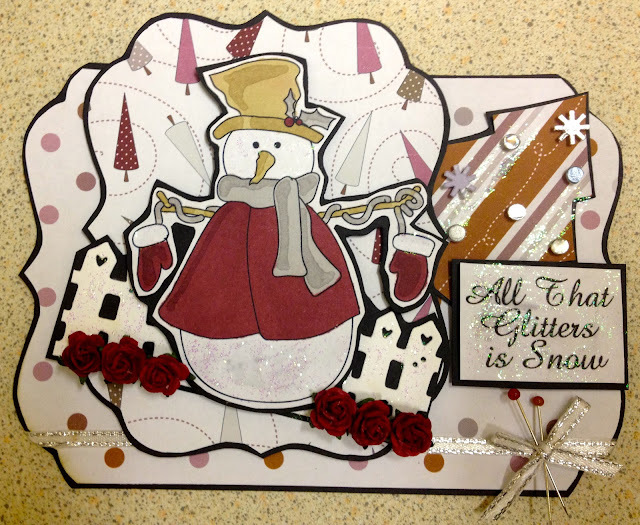 Eva - I have made a shaped card using a cute snowman image and papers from Sundae of Seasons. The sentiment is from Picknix 2 - Gingerbread Twist. I used dies from Crafts Too and a Christmas Tree die from Marianne's CR1227. Used a Magnolia die for the fence, some sparkly ribbon and mini hat pins. Added lots of glitter, roses and mini snowflakes too. 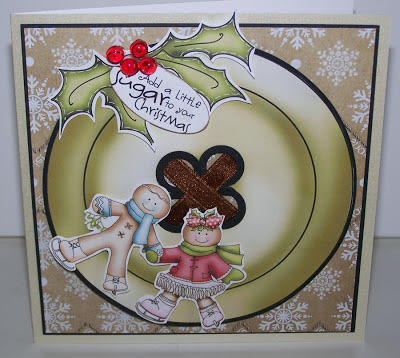 Clare - For this weeks challenge I have made a circle easel card. 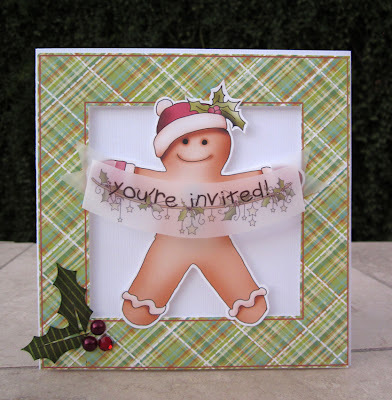 The gorgeous paper's are from Studio 12 Picknix Collection "Gingerbread Twist" CD, the cute image is from Sundae of Seasons CD and the sentiment is from the Here Comes Christmas CD. The poinsettia die is by Marianne Designs. 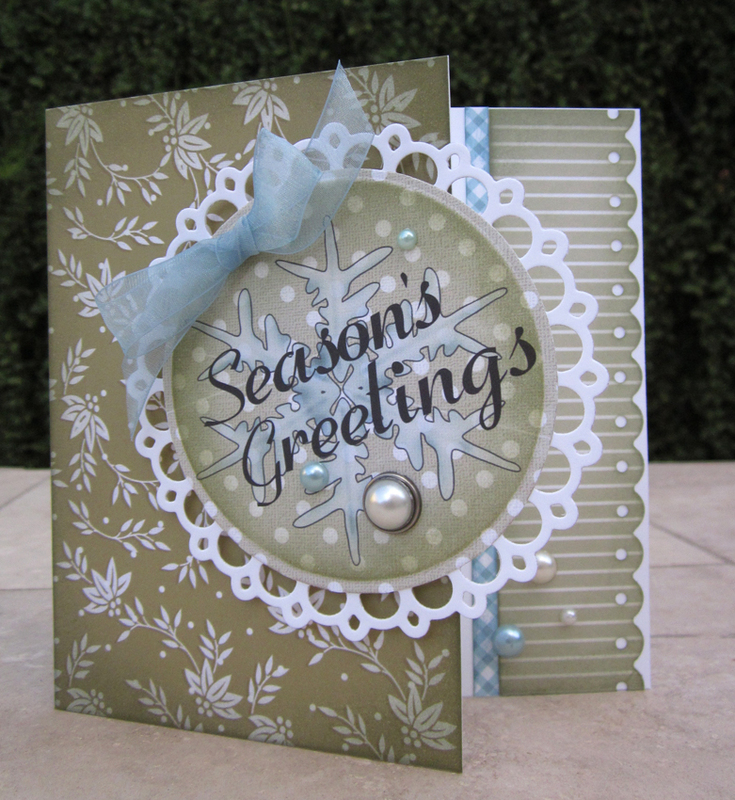 I have used Turquoise Doodle Dewdrops for the centres of the poinsettia's and covered the petals with diamond Stickles. Kitty - This week i decided to create a winter scene card with my favourite animals - penguins of course! The papers and images are all from the Here Comes Christmas CD. 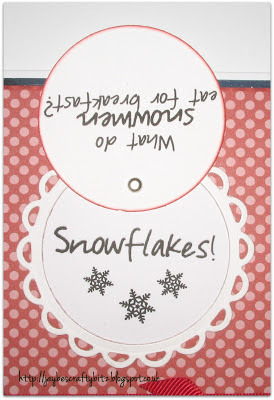 I also used Cheery Lynn Snowflakes die and Dienamics Snow Drifts (altho you can't see them!). I also added lots of Stickles Glitter to the trees and snow. Good luck with the challenge and please remember our rules - deadline for entries is Sunday 2 December at 12noon GMT. Hi everyone, can't believe it's Friday again and that Christmas seems to be looming ever faster by the day! It's time for a new challenge and this week we're delighted that some of our new Design Team ladies have pulled out all the stops to be able to join us today and start showing off their talent. The winner from this challenge will receive a copy of the absolutely gorgeous Studio 12 Picknix Collection 1 CD! Please don't forget to follow our rules which are below. Congratulations! Carla please email Nikky to claim your prize and all the blinkies can be found in the sidebar. Please remember to add the verification code and the challenge week in the subject field on your email - you must use the code given above to claim your prize otherwise we cannot release it. Good luck with the challenge - the deadline for entries is Sunday 25 November at 12noon GMT. Fabi- For my project I made a rectangular card, I have used Kraft paper for the base of the card, and papers and elements from the Pretty Tuff CD-Rom . I have replaced the string of the balloon with a piece of twine. The round element is the ball. Shell-For my card this week I've used papers from the Magical Winter CD's, the image and sentiments are from the Studio 12 picknix Gingerbread Twist. The fab snowman image has been coloured with copics....The trees are also from Gingerbread Twist I printed 2 sizes, cut them out and added some glitter. 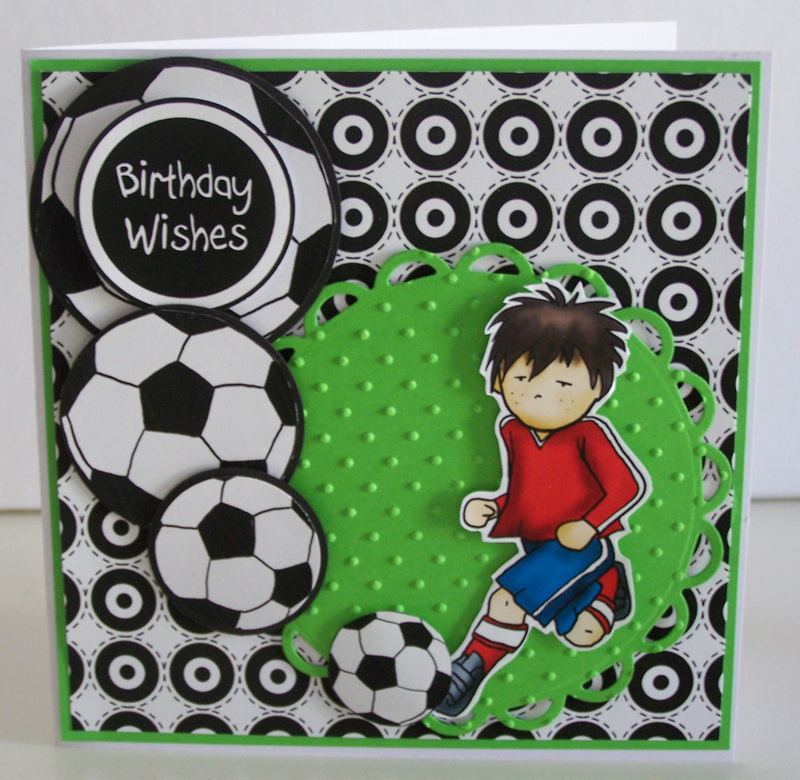 I then added some die cuts to complete the card. Karen - For my card I used paper, sentiment and image from the Picknix 2 CD I coloured this lovely image with ProMarkers and added lots of sparkle, I just love snow people.... lol. The round elements are the main image and gems. Karon - For my card I used backing papers from my stash. The butterfly and flower were both from the Picknix Collection 1 CD. I used the pre-coloured images, however they are also on the CD as black and white digital stamps for you to colour. I cut the butterfly twice, layered with pop dots on the body and added some decorative wire for the antennae. The flower was cut twice in two different sizes. The sentiment is from a set I bought many moons ago whilst still living in the UK. Asha - It's Christmas in my world! I made a 5" square card using patterned papers, digi and sentiment from PickNix Collection Gingerbread Twist. I coloured Santa with alcohol markers and used twine and bling from my stash. All that's left is to convince the jolly ol' man that I'm nice ...most of the time! 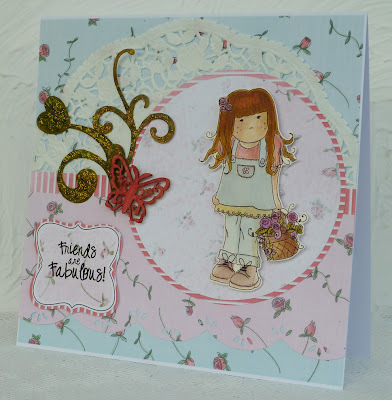 Fliss - I've gone all girly for my card this week using elements all from the Pretty Sweet CD. I coloured the cute Amelia with Aquamarkers and did lots of matting and layering with some of the pretty papers. I added a doily, a wooden butterfly altered with a pink Promarker and some glittered up die cuts. JAN: Another snowman from me - there must be something in the air! I made a square Christmas card using papers, images and sentiments from the 'Here Comes Christmas CD'. My round element displays a little snowman joke - just twist the top circle to reveal the answer underneath! 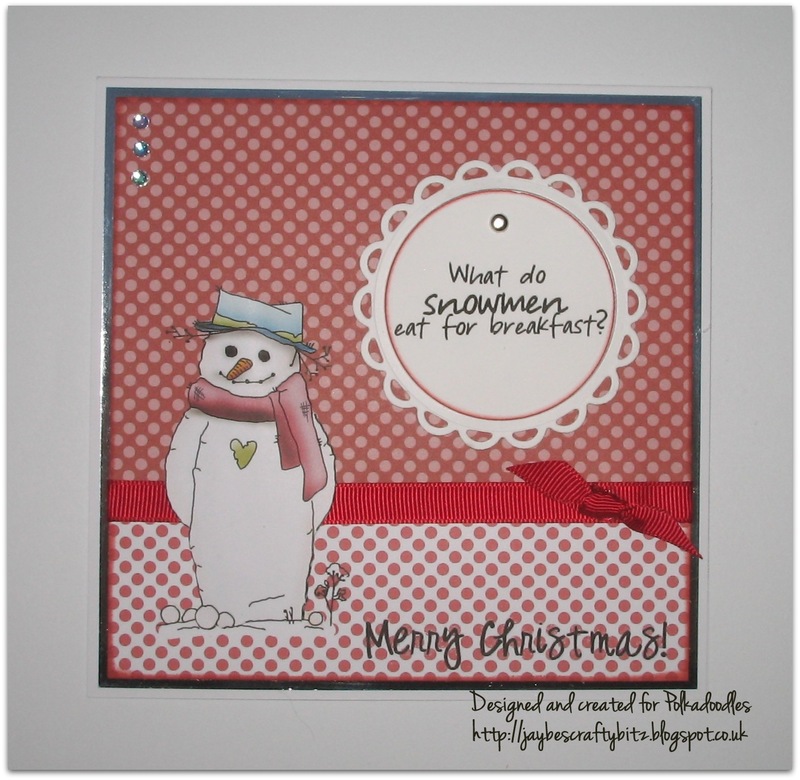 Sally - This was my first card I made before I received my lovely downloads from Nikky. I used the Casey image from Pretty Tuff CD Rom and the footballs. Picked the backing paper from the Candy Doodles CD Rom matted it in bright green, matted the footballs in black and cut a Spellbinders circle in green and embossed it with a dotty embossing folder. I've also made a second card and have gone with download papers and characters that Nikky sent us from the Picknix 2 CD. Matt and layered the backing paper with black card. Matt and layered the huge button with black card also. Added some ribbon in the button holes and some dew drops from my crafty stash for the berries on the holly. Norine: Here's my card for the square/round challenge! The front of the card is cut shorter than the back so the inside edge shows on the front. I used Spellbinders dies and Fiskars edge cutters, and paper and images from the Here Comes Christmas cd and the green patterned papers are from the Pretty Sweet cd. 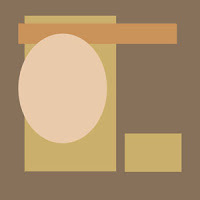 Valou250809: Here is my card for the challenge "Square Card With A Round Element". I used papers from the CD " Sundae of Seasons ". A fabulous mix of pink and mauve in particular. There are other colours in the same theme on this CD. The sweet bear is from the Spring collection. To stick the butterfly, the place mat and the leaves, I used Zig glue. On the border, I used gems. Small mauve roses are stuck below on the right. 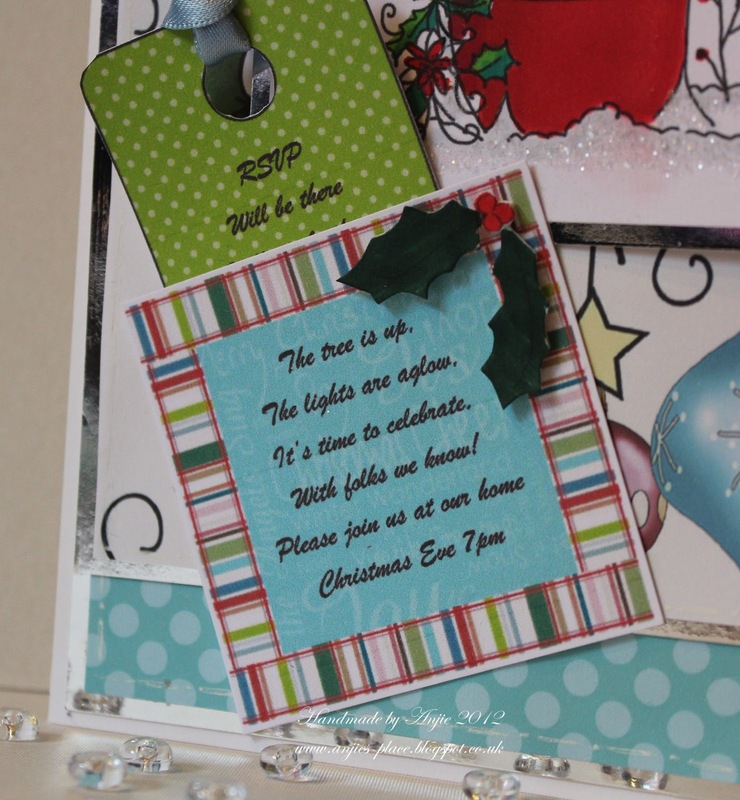 Helen: For my card I have used an image from Here Comes Christmas. 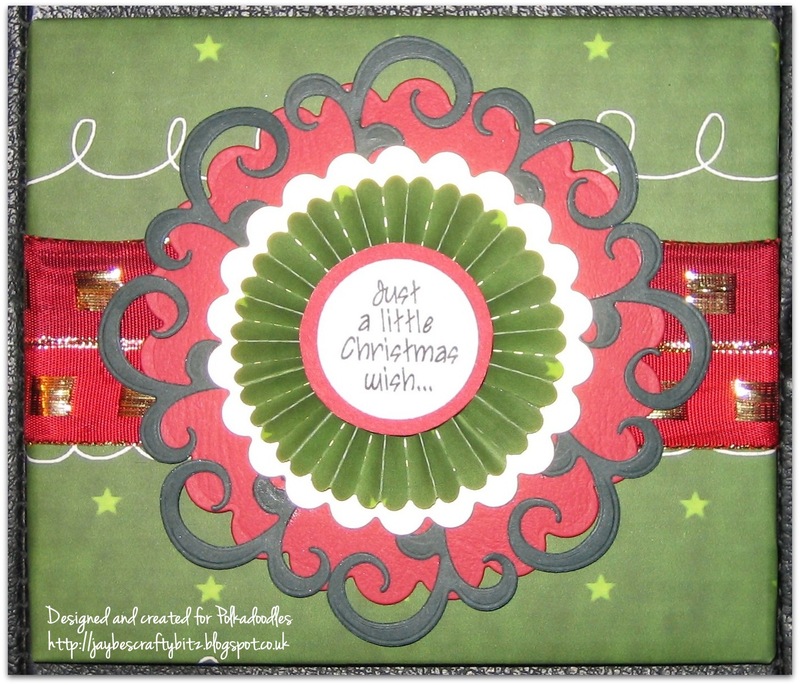 I cut out using a circle die, I then mounted on a red scalloped circle. I printed out 2 backing papers from the same CD. I distressed using Vintage Photo ink. I added a border I cut from a Memory Box die, also the swirl. The poinsettia was cut using a Marianne die. I cut out one of the tickets and distressed. I finished off with some pearls and a touch of glitter. Haven't our new teamies done some fabulous creations! Now it's your turn and you have until 12 noon on Sunday 25 November to get your entries in. Good luck! Hello everyone! We have some extremely exciting news today - we can now proudly announce our fabulously talented INTERNATIONAL DESIGN TEAM!! So make sure you click on their bloglinks and follow their wonderful blogs to get all their latest makes and creative inspiration! And the winner of this challenge will receive a copy of the Studio 12 Picknix Vol 1 CD with a download each for second and third placed entrants. Congratulations! Elaine please email Nikky with your postal details - all the blinkies can be found in the sidebar. Please remember to add the verification code and the challenge week in the subject field on your email - you must use the code given above to claim your prize otherwise we cannot release it. Good luck with the challenge - deadline for entries is Sunday 18 November at 12noon GMT. 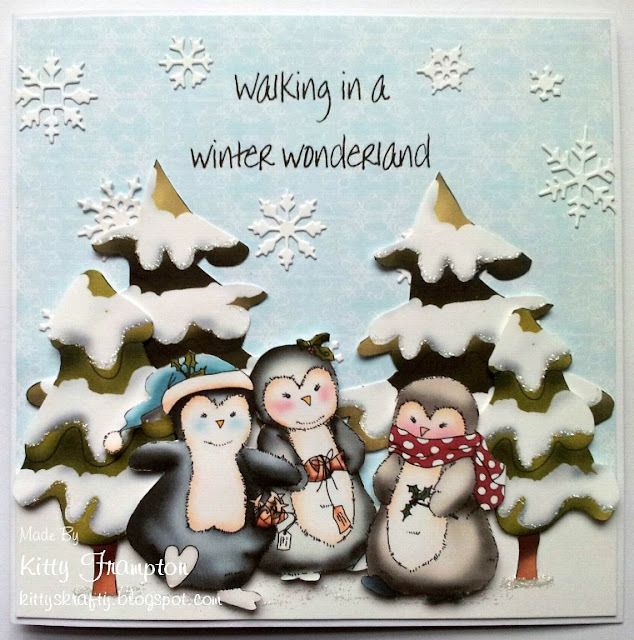 Ruth: I've used the very cute Penguin Pip from Magical Winter Vol 1 cd - I've simply printed the toppers onto card, layered them onto some red card and then onto my card blank. And if you look closely I've glittered the edges of the image and also the sign! Really quick and easy to make and great if you need to do lots for an impromptu party! Anjie For this card I've used images and papers from Here Comes Christmas. I've coloured the image in with ProMarkers and added some glitter on the snow areas. The message topper is made up of a paper and a border from the CD with a the message done in word. 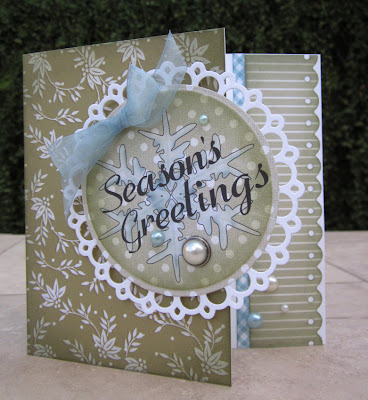 The snowflakes and flowers are done using some Marianne Design dies. The RSVP is tucked in behind the invite message. Norine: There are just TOO many cute designs on the new Here Comes Christmas cd, but I made myself stop with just one card for this challenge! Everything on this card is from that cd. 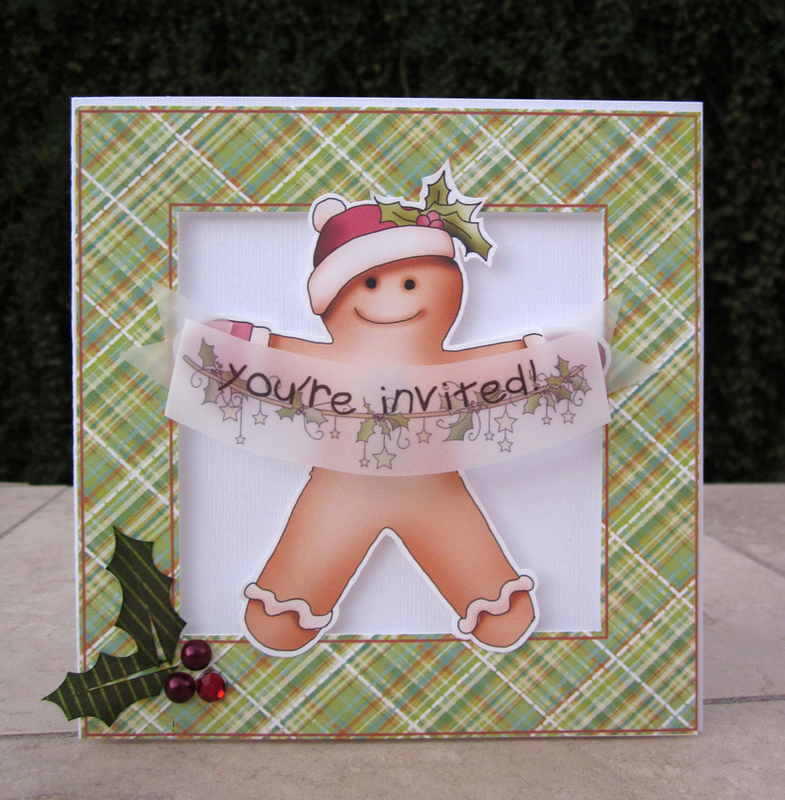 I printed the frame and gingerbread boy, cut them out and then mounted them on the card with pop-dots. Then I overlaid the words on a slightly desaturated holly garland and printed that on vellum. Love those 3D folded banners, right?? 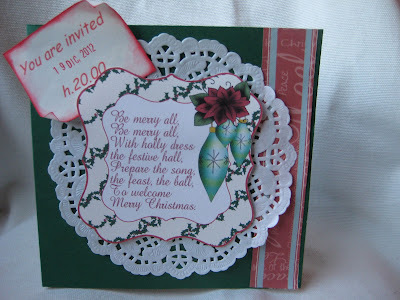 The holly leaves are a Silhouette Cameo cut design and the pearls and gems are Prima and My Mind's Eye. Wouldn't this make a great invite to a Christmas cookie exchange? Helen: For this card I have used images from Here Comes Christmas. The Christmas lights are from Sundae of Seasons and the Letters and Dec 25 from Picknix 2. I imported the deers, lights and letters into Photoshop ,combined and created the topper. I added glossy accents to baubles and pearls for the deer's nose. Miria I made a last minute card for an invitation, I used image and border from Here Comes Christmas cd and just added a doily and a computer generated tag. Quick and easy! 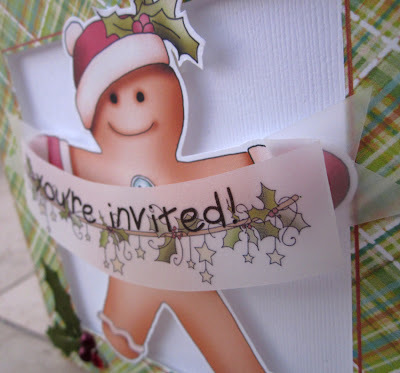 Eva - For this invitation I used papers from Picknix 2 - Gingerbread Twist. The image is from the Sundae of Seasons CD. 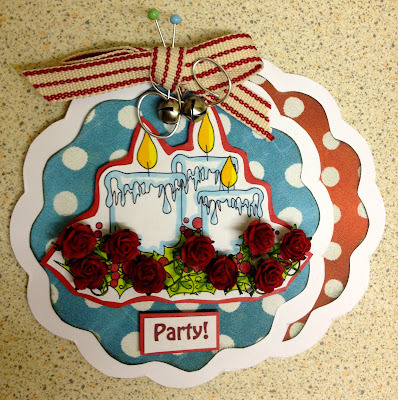 I used Spellbinders dies for the shape, and added some roses, bells, ribbon, craft wire and pins. The sentiment is computer generated. The invite details flip out. Clare - For my invitation I have used gorgeous paper's and images from both Studio 12 Picknix 2 Gingerbread Twist and Here Comes Christmas. The bunting is from a Stampin Up punch. Lots of yummy Stickles Glitter Glue. Everything else is from my stash. The invitation is tied with ribbon from back to front and tied at the side to open. I have computer generated words for the inside of the invitation and added more lovely images and stickles!!! !.